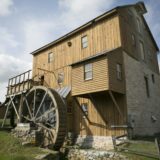 Located in the Shenandoah Valley of Virginia, Wade's Mill (c.1750) is a working water powered grist mill listed on the National Register of Historic Places. The 2018 exhibit "Milling and Distilling to Wade's Mill" is on loan from the Brownsburg Museum. Gift shop with flours and mixes. March 31 - December 22: Open Wed-Sun, 10am-5pm.